Trivium Pursuit’s newest curriculum is now available — What Do You See? A Child’s First Introduction to Art, Volume 1 [Kindle Edition] by Laurie Bluedorn. This 36-page ebook can be purchased on Amazon for $2.99, but from April 14-18 you can download the ebook for free, plus receive another Trivium Pursuit ebook. Details below. What Do You See? A Child’s First Introduction to Art is a gentle and easy introduction to art appreciation for children, ages 4-12. Our goal is to introduce children to basic concepts in learning how to look at a piece of art and evaluate it. In addition, we want to spark in the child a love for the great works of art. 1. It will stimulate them to ask questions. 2. It will cause them to try to understand why the artist painted what he did. 3. It will push them to pay attention to details the artist placed inside his painting. 4. It will make them curious and perhaps try to paint something themselves. 5. It will stimulate them to research the life of the artist and the history of the painting. The students and teacher should spend a bit of time observing the painting, and then answer the questions. Since one of our goals is to learn to love art, we recommend that you ask the child to answer the questions orally, not with pencil and paper. We want to make the learning experience enjoyable for you and the children. This first volume will introduce only one art principle — Center of Interest. A center of interest is the all-important part of a painting — that part of the picture where the artist wants you to look first and which attracts the mind. The center of interest often has the sharpest edges, the brightest colors, and the most detail. In addition, it often contains a color that doesn’t exist anywhere else on the painting. Keep in mind, though, not all paintings contain a center of interest, plus, unless the artist has told us what he intended his center of interest to be, there could be differences of opinion as to a painting’s center of interest. Harvey and Laurie Bluedorn started homeschooling their children in 1980 and have given workshops on homeschooling and classical education for support groups and at conventions across the country. Their publishing company Trivium Pursuit produces books and curricula to help parents use classical education in their homeschool. The Bluedorns live in New Boston, Illinois, and can be reached by visiting their web site. Sign up for the Homeschooling with the Trivium e-letter. After you download What Do You See? 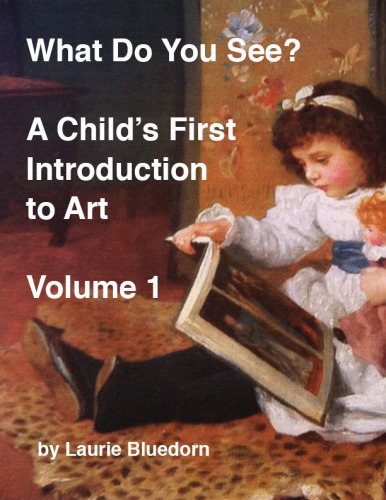 A Child’s First Introduction to Art, Volume 1 and post your review, then email us (bluedorn @ triviumpursuit.com) with the name you wrote your review under and tell us which of the above ebooks you would like. This entry was posted on Tuesday, April 7th, 2015 at 10:15 pm	and is filed under Art, New Trivium Pursuit Product. You can follow any responses to this entry through the RSS 2.0 feed. Both comments and pings are currently closed.